Abuja Events and Places (AEP): Unbelievable!!! Imported Jollof Rice, Egusi Soup And Yam Porridge From India??? Unbelievable!!! Imported Jollof Rice, Egusi Soup And Yam Porridge From India??? like Egusi Soup, Jollof Rice, Ogbono, Yam Porridge imported from India. 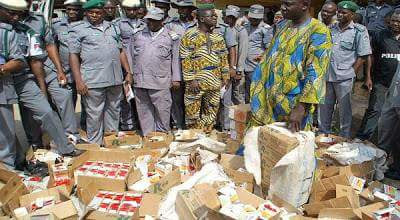 In a statement issued in Lagos, the Customs Area Controller, Bashar Yusuf, disclosed this while handing over the container of imported prepared foods to officials of the National Agency for Food and Drug Administration and Control (NAFDAC). The controller described the scenario as an “aberration”, considering the fact that government granted zero duty for the importation of machinery for the packaging of agricultural products. He lamented why indigenous menu should be imported into the country at a time when investors are much sought after to boost local industries. NIGERIA NEWS HEADLINES FOR MONDAY 17TH SEPTEMBER 2018.